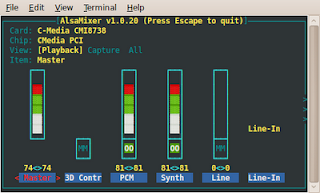 I have just installed Ubuntu 9.10 "Karmic Koala" on a PC containing a C-Media Electronics Inc CM8738 sound-card. Quite oddly, although the microphone seemed to work thru Application->Sound & Video->PulseAudio Volume Control, there was no playback from the Skype call testing service. 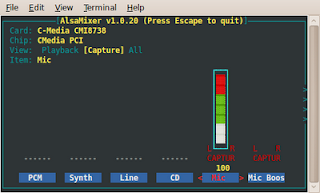 Now press the Up Arrow to increase your volume to an acceptable level (I have set it to the max just in case), and press ESC to exit from the mixer. This sets the microphone as the default input device with an adequate volume.